The stats, the look, the name, all perfect! Appears to drop somewhere in Naxx25, Not sure where however. I most say that this is the biggest %&¤#ing weapon i ever seen its like 4 times bigger then my undead! I bet you anything this drops from the Four Horseman Chest, which happens to represent the Four Horsemen of the Apocalypse. And what happens during the time of the Apocalypse? Armageddon! Ok, so I haven't mastered all the DPS math & mechanics of the new Fury Warrior abilities, but I'm thinking a Fury Warrior Dual wielding this non-unique sword with 200 Haste would be pretty sweet. You know that with TG you can only carry one 2h weapon at a time, right? Not the best choice for names. Imagine the next 2H from say, Ulduar, drops and it's called Stone Giant's Slayer or something less world ending (the irony!) and destroys this thing. Names like this were better saved for final expansion end-game items or at least for the last raid of a given xpack (where the next ten levels/zone pretty much feels like a different game anyway). With it's size, it is a rival for ashkandi. Truly insane. Wish my shaman could use it. This sword for sure looks really great. It would fit more to the Dungeon in Wintergrasp due to looking dwarf-ish, but it's still great, DPS, Stats and Look are just awesome (greater than your char if equipped :O). I'm guessing that this "replaces" Claymore of Unholy Might, or Corrupted Ashbringer in the revisited Naxxramas. This would make Gluth or The Four Horsemen most likely to drop this. I really like the way blizz is going with weapon models, and this is a perfect example. check the wep with tauren male! and imagin 2x of them! THATS INSANE! If you think that's huge, preview it on a human female. Yeah they seriously need to shrink down Human Female weapon size, it's really ridiculous how big even one-handed weapons look in comparison to the other races. Dual wielding this on a fury warrior will look delicious - have a look on the 3D viewer at the top of the page. SO FAR, this is the best two hand tanking weapon for dks for one reason, the stamina. I really hope to see a weapon with defense soon but until then this is your alternative. With strength, that's AP and thus threat for DKs, 108 stam is 1080 stamina so this will be the weapon for BOTH dps and dk tanks for a bit. Looks nice, i really like those "over-the-top-size" swords, but clearly a ripoff of the Grand Marshal Greatsword with a slightly different model and skin. Looks nice, i really like those "over-the-top-size" swords, but clearly a ripoff of the Grand Marshal's Claymore with a slightly different model and skin. pch....too big model...I dislike this Blizz's way: "bigger=better"
Beside... what about a tiny weapon?The big designe is a pice of the "viking" style that is a part of the orgin of nothred such as the thundra "fjord" and snow cowerd landscape so I like the size it match the theme but in TBC it could have been diffrent. you have heard wrong, dual weilding would = getting parried a lot more, which gives the boss many more hasted swings. an increase in dmg taken. A tanking DK's threat comes from their spells, increasing auto-attack dmg at the cost of reducing their strike dmg (a large portion of dk dmg comes from wepdmg% + X moves) would make this a seriously bad decision. Well the design is way to big if you can´t see the whole weapon cause it going under the ground. This is going to be ridiculous for Titans grip. i wish they had that idea for us draenai females, our weapons are TINY! Guts (Berserk) called, he wants his sword back. Help yourself to a cookie if you know who I'm talking about. Deceptively huge indeed. You can't tell the size of the damn thing until you see it on a character. Simple and crude (as is WotLK's theme for weapon design it seems), but definitely something you don't want to be on the recieving end of. Is it just me, or is this sword being held together by duct tape? Yeah, I want one of these. I don't care if it is made with duck tape. That is the handy man's secret weapon. (Duck Tape). DUCKTAPED SWORD COMES FOR YOU! I really hope thats high velocity duct tape. Two of these giant babies would look pretty insane on a tauren warrior with Titan's Grip. Let's hope it's fiber glass duct tape. am pretty sure this give you immune to the spell "Armageddon"
I have to say that the stats on this is quite scary, especially is you're a Fury Warrior. its 101 in Strength means you get 202 Attack Power, and with DPS calculations, it means you gain an extra 49.5 DPS per second from just one of these. with two, you then have 99 DPS per second. With stamina, it's a flat 1080 HP per weapon, totally to 2160 with Titans Grip. These are all without buffs. Are you gettin' it? Armageddon it! Ohh, really gettin' it? Yes, I'ma' gettin' it! Cmon, get it! Sorry, had to sing something that came to mind when I saw this sword. This giant piece of Awesome really brings a shine to Two-handed swords. View this in 3-D with a Gnome, it literally defies all laws of physics. Dropps at The Four Horseman in Naxxramas heroic mode. It's from the Berserk anime, wheres my damn cookie? Grand Marshal's Claymore remake with different model/colors, a nice big over the top sized cookiecutter. Check it out on male Tauren model. This is absurdly huge. Dps with this sword could be up to 10m per second per second! Oh boy! Another fast 2 hand sword with haste rating, why do I get the feeling there aren't going to be many swords itemized for death knights? Still a very good weapon for DK. This weapon might be a reference to Buster Sword from Final Fantasy 7, used by Cloud. 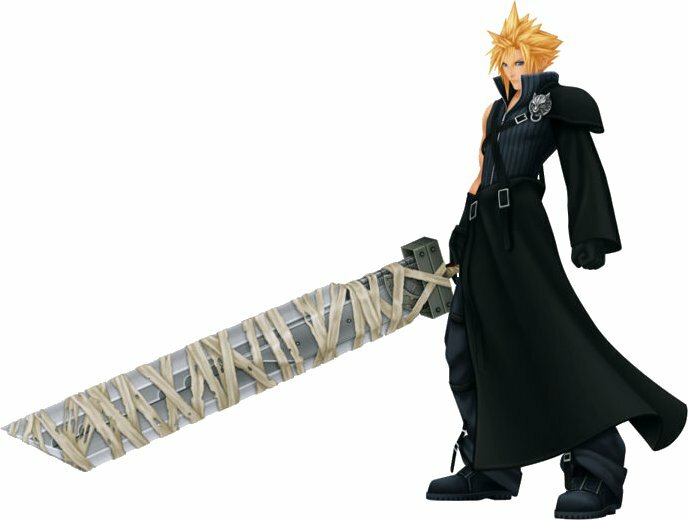 Buster Sword appears bandaged, just like this one, wielded by Cloud on Kingdom Hearts too. Its size also matches the size of Buster Sword. Could The Key be a reference to Kingdom Hearts too? Not that good to DW as it has no hit on it. Basically every piece of gear for a TG warrior is going to need hit on it. The size of it is ridiculous... hope they make it somewhat more realistic. Ugh, Final Fantasy Fanboy making posts. First thing I thought to myself, this might come closest to comparing the blade of Gatsu from Berserk. Bricks. They will be shat. AHAHAHHA click at "viev in 3d" button and try this sword on different models of races with it. The largest size is in gnomes' hands! New Greatsword, NOW WITH PLAYERS ATTACHED! HOLY SH!IT that things HUGE! If I would get this for my TG spec. it would only be because of the haste. Otherwise I only find this one good for Arms. But that is my meaning about this sword. But im open to other thoughts and ideas. If you think that's something check out male troll model.... sick. not especially although i see your point, blizz reduced the miss down to 5% and the Precision talent further reduces it down to 2% which wont take much hit ratign gear to make up... but everyone hates missing that killing blow right? Christ, that is one huge sword. This sword would make a good signature weapon for BigWang. Could it be possible that they are trying to slow them down because they have such high DPS that in some cases you would have warriors dual wielding two weps like this? 200+dps dual wield could make life a little bit difficult for warriors. especially since they also get a haste penalty when they use titans grip too. That's just my guess. at the moment, its not even unique, so there is still the possibility of fury warriors to duel weild this. may need a nerf? Currently (at the time of this post) the highest DPS based 2H sword, slightly better than the PvP equivelant. Currently the highest DPS based 2H sword, slightly better than the PvP equivelant. This sword would be the best to wield with Titan's Grip - the new warrior fury talent that enables the warrior to ignore handed requirements. Has to be the best name for a HUGE 2H sword EVER! This will be my weapon of choice for my Ret pally (even though the Betrayal of Humanity (http://www.wowhead.com/?item=40384) is clearly better), nothing is more scarier then seeing a character (be it dks, pallies or wars). This will be the weapon many people will running away from in PvP. Frankly, this weapon is just damn ridiculous. It's bigger than most PEOPLE, and serves to make people look like they just popped out of an anime. I wouldn't be scared of dual-wielded Armageddons: I'd laugh. It is humanly impossible to swing something that big with one hand and hit someone. It's pretty much impossible to swing this thing with two hands. Actually it is damage per second^2, as I recall from calculus and physics in college. This was discussed in explanation as to why accelerations (specifically acceleration due to gravity) is often times listed as 32 ft / sec^2 rather than 32 ft / sec / sec. It is mathematically sound, although it seems counterintuitive. All this is irrelevant, since DPS per second is nonexistent. I just figured we should be operating with correct mathematics. This dropped for my guild yesterday off Gluth in heroic Naxxramas. It's probably longer than the totem the Taurens used to drag around, scary. would sell my ret paladins soul for this..almost.. This thing is definitely from "Berserk" Anime. It looks like this only blizz made some additions with graphics. In Anime it was described as :"That thing was too big to be called a sword. It was too big, too thick, too heavy, and too rough, it was more like a large hunk of iron." According to Anime that sword was called Dragon Slayer, but knowing that Guts was fighting with demons new name Armageddon suits here too. Not unique? :\ TG FTW? I don't know if you've noticed but certain races got fists larger than their heads. The Onslaught Death Knights outside Frostmourne Cavern wield the same model blade. 25 or 10? Never can tell the difference.. what is the difference? This would be a great weapon for a ret paladin that 101 strength and 831 top end damage is going to cause some real damage in PvE and PvP! i was just thinking, that sword looks a lot like the buster sword. A sword the size of a tree... with a 3.40 speed (3.30 counting in the 100 haste it has) =(. This thing so should've been the first epic 4.00 2hander. Wow this must be great for DK's and it looks sick. I think maybe you didn't think to view the per second part as translating to divided by seconds, which resultantly makes the term appear as you were stating in the end (s^-2). I can imagine some giant tauren warrior duel wielding Frostmourne and this, and thats just Legendary. Armageddon means the end of the world so it does happen during the apocalypse,unless you're refering to a quote from a show or movie. In revolations there was a place called harmagedon, which translates into armagedon. So he was just simply quoting the bible. It's just like the Torch of the Damned. :] Great stats, and still has the good looks to boot. I saw a Gnome Fury Warrior duel wielding two of these. I was amazed he could walk. anyone else thinks this looks like the buster blade? The power's in the tape. Alright, I saw the comment up above that this would be a good DK dps item. As I have gone through and tested what someone on the boards stated, that two handers are the best for DK tanking, and now acknowledge it to be true, my question is this. Would a DK tank benefit from this? It's quite similar stam wise to Dreadlord's Blade, but has a lot more strength, which would cause increased parry. Would it be worth the hit rating loss though due to the fact that you're swinging faster due to the haste but at the same time, you're hitting a lot harder due to the large amount of strength and crit strike rating? Thi sword I think is rather overlooked. Sure it is huge, has damn good skin, damn good name, drops from a 25 man badass boss (okays, bosses) but it is not that good. There are basically 3 classes which would use it: warriors, paladins and deathknights. Comparing this one to the 10man axe, Death's Bite this sword loses its craft somehow. The other has same str, same dmg, same speed and more crit (+32 rating). Even more stamina, but let us take that out of consideration, only useful for Dks tanking (or pvp, before any freak would add that). The fact that it has hit instead of haste makes it better for TG warriors and basically anyone not hitcapped. Hitcap is the key since if you have it, the sword is better. Almost forgot, not a huge factor, but the axe is more easily accessible being a 10man drop. OMG lvl 70 fury warior plus about 50 raids on Naxxramas = verrrry verrry happy person :P TITANS GRIP FTW! Frostmourne is going to be Deathknight only dumbass. Are you gettin' it? Armageddon it! Ohh, really gettin' it? Yes, I'ma gettin' it! A gnome with this makes Newton want to re-write the laws of physics. A gnome fury warrior duel wielding this makes Newton want to kill himself. Obviously made by Japanese animators. This is obviously a Hunter weapon. The bible calls this sword Armageddon, the end of all things. Damage per second per second? In acceleration sciences, the concept of seconds squared is acceptable, but it's a crazy thing to imagine - we've squared measurements of distance, but I can't recall that a human being has ever squared a measurement of time and lived to tell about it. However, if you could do damage per second per second, it'd be sec^-2. not sec^2 as most would imagine. If you had seconds times seconds, that's sec^2 - but dps/s is sec^-2, and thus you're doing damage over a negatively squared period of time. Absolutely confusing. Essentially, we're adding super-useless comments to Wowhead just because someone probably was typing too fast in order to think about DPS per second, and in fact, his purged comment about scary fury warriors was more informing than ours. How effective would this build/gearing be? Obvious goal is taking a ret pally and going deep enough to obtain Reckoning and to drop the weapon speed to close to 2. Har megiddo does n mean mount meggido yes, but was translated, or whatever you want to call it, into Armageddon. so Traa teranas is correct, it is a place. Armageddon, the fear of all ground textures. I was about to rate up Yuka2's comment until I saw it was +69. Considering the context, I don't know if I want to change the rating anymore. Among the biblical Four Horseman, the Red Horseman of War is said to have been given a 'large sword'. They weren't exxagerating. It would make more sense if this sword actually dropped from the Four Horsemen. does glowing enchants work on this? where can I get this sword? Please someone get a pick of a gnome warrior with titans grip dual wielding these! Pretty sure it doesn't matter since all the stuff mentioned above is made up anyway. People should bump it down to 69. Is there any info on the Drop Ratio of this Sword? Blizzard has been taking notes from Japanese designers. Giant disproportional sword wrapped in tape, normally used by spiky-haired emokids with limit breaks. Actually, armagedon comes from hebrew "Har-maggedon", which was place where ancient israelites used to burn trash. So place of destuction and fire. The Bible is full of comparsions like this. All damage per second per second does is show you the change of the slope on the graph of your dps at any point in time. It would be the intergration of an equation used to determine your dps through a set length of time. Hence we have speed, the integration of speed is velocity, the intergration of velocity is accleration. Accleration is velocity per second, per second. Therefore the integration of dps is dps per second, or dps/sec. Just thought I'd let you all know, that has nothing to do with physics, its Calc 1. Too bad this is only for heroic mode. My guild only does 10 man naxx. I hope a Death's Bite (which is equal to this sword imo) drops. can this be used as a DK tanking sword or is it better for a ret pally? Every last person above this comment are beyond pathetic. Genuinely pity you. This is a MMORPG database used for item discussion, not bloody physics. Go and harass your nerds on Science forums with this b*llocks and let the page be used for actually discussing the weapon instead of "nerding" on about a typo! The weapon itself - excellent for all melee DPS classes, especially those who get added benefit from Haste. Not humanly possible, no. Tauren or Orcly? Mayhaps. The above two points are completely true. Godly for Titan's Grip Fury Warriors, and a waste if a DK or a Paladin rolls on this ahead of one. Am I the only one who is reminded of Devil May Cry by this weapon? I agree that crit instead of haste would be better for a ret paladin. However, 3.4 weapon speed is good for a paladin using SoB/SoM, which a ret paladin should be using anyway so long as they don't have a weapon that has ~4.0 attack speed. This is a the best 2h sword for a dps warrior, death knight, or ret pally. And since it's not unique, some lucky fury warrior can dual wield these! It is humanly impossible to swing something that big with one hand and hit someone. Haste and AP are the main two stat's for DW Death Knight's. Whats the point of that info in a 2H sword page? This is why Death's bite is better. I got this on my female BE paladin, and am annoyed that it looks so small! Why does everything on a female BE look so small and puny? Wish Blizzard would fix it! When it charges you, you will only see the sword.. Weapons these days look like #$%^, they are massive and look completly un-usable. You'd have to be like 14 to actually think this #$%^ looks good. It's about time they designed some nice looking items. Because DKs have Titan's Grip so they can DW this too right? But a DW DK is not able to wear a two handed sword so this is pointless. And when looking at the classes/specs that can atleast USE this thing (Ret Pal, Fury/Arms Warrior, Blood/Unholy DK) one has to admit that haste is the most inferior "offensiv" stat and that this swords "wastes" alot of itemization points on it. can someone link it with mongoose? This weapon has a strange red trail behind it when I sometimes swing it or use Divine storm. A very nice touch. I think I've only seen this be done with a blue trail for Thunderfury. Currently Inevitable Defeat is being eyed by some former guildmates with DKs. The Betrayer of Humanity also has a ton of hunters and warriors looking for this too. Leaving this and The Jawbone. got this last night from the horseman chest, and while i was bummed to see a bit of haste on there, iin combination with the unholy presence and the sepc i am i think 15/0/49 the results are pretty interesting, i should say that the white dmg is way huge, and in between me throwing this thing for 6k crits, and my aoe and spell abilities, this isnt bad for an unholy dk. OK, I'm a Fury spec-warrior and wondering, is two Armageddons better than two Runeblades of Demonstrable power? Gnome Warrior + Titan's Grip + Armageddon x2 = ? I thought the huge weapon was dropped by Gluth in the Naxxramas raid wiht a 1.3% drop rate? i just find it a bit odd how such a huge friggin sword actually allows you to swing it faster..
Kinda odd that a huge slab of metal helps you swing faster. "Duck tape"? Come on kids, don't you study history in your &*! @ty country? Ever heard of The Spear of Destiny? I regret to report that this weapon, regardless of its incredible stats, looks completely retarded. I know exaggerated weaponry is part of the warcraft aesthetic, but surely they can stop short of people wielding weapons larger than themselves? So large, it looks normally sized on a female blood elf. I would imagine how large this would be on a Tauren. And I don't know why the guy that openned this discussion got purged, he is actually right, I believe it is just a miss undestanding in reading, it is only DPS (damage per second). So, there I was, doing some arena PvP. My brother on his epic resto druid with his awesome healing prowess and I were feeling pretty good, since we had won the last two matches, me being a completely PvE geared warlock. So, there I was, pretty confident, right until I see a hoofed monstrosity running at me with wielding two blades that were bigger than HIS body. So there I was, wearing a dress holding some kitchen knife and some strange ornament, my life depending on my ability run, dot and fear, and on a healing piece of wood. "You cannot do that while you are stunned." "DualWieldingMonstrosity crits you for 6k." "DualWieldingMonstrosity crits you for 7k." "DualWieldingMonstrosity's execute crits you for 11k." This sword is what i call AWSOOOME! Anyone attempting to duel wield this would break their arms. A gnome would probably explode. Haha very funny with the exploding gnome, but i think he's arms would fall off rather than him exploding. I believe it is cos it is so heavy it makes u spin faster and faster all the time. Wow, we wowheaders came up with a new word: "duel wield". 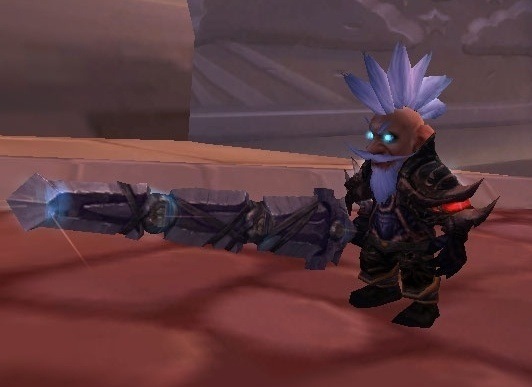 Yes, a gnome fury warrior would look exceptionally strange DUAL wielding this sword. Consider this with a human female who has it at about 125-150% of normal size. Also would love to see one of these enchanted with Mongoose. In direct translation to Hebrew it means "Har Meggido" which is mount Meggido, a mountain in Israel. It is believed that the final battle between good and evil will take place on this mountain. A lot of people feel this item is too flashy to be actually good. They would be wrong. It's the 2nd best in game for melee dps, and the look makes it the best. Yeah, vanity counts. The modern usage of cataclysm is mostly confined to geological phenomena of high significance, such as the destruction of Pompeii, the Tunguska event, or the 2004 Indian Ocean earthquake. So it's bad, but not quite bad enough to be on the scale of an armageddon! Absolutely incorrect. Though your comment about the squared time is interesting, it's merely an unnecessary complication of a simple concept. Acceleration is meters per second per second, in other words how much the rate you're moving (meters per second) is changing. Damage per second per second would simply be the rate at which your DPS increases. Don't bring math to a Physics fight. Armageddon: The BFG of Warcraft. Outstanding sword, both in looks, and in quality. Still an excellent weapon though...I sure as hell wouldn't pass it up. A great sword in terms of looks, name and stats. Currently in the top five of the 3.0.9 Retribution Paladin's wishlist. The only nitpick with this blade is probably with Attack Speed of 3.40. Although, this is probably scaled to the favour of Fury's Titan Grip. And although it may be unintentional, kudos on Blizzard's tribute to fans of Berserk, Final Fantasy and Bleach. Big swords. We need more of them to appease the Gods of Excess. "That thing is too huge to be a sword. Too rough, too wide and too thick... it was more like a huge hunk of iron." the day i got this blade i got killed twice by it! damned horde! 101Str = 202AP ----> 404AP+170=575AP and about 2.5%Crit and 6.1%Haste..
Add Exceptional Agility or something similar to it and it's a perfect blade for Arms spec. Great DPS and strength means that base DPS should be around 400-500, with uncritted white hits near 1200-1500. Toss in the extra agility so the crit % is maintained near or above 20 and you have a weapon that can do serious damage in your attack sequencing, especially during Bladestorm. Agility? For a warrior? You are joking, aren't you? A WoW player calling someone a nerd...*cough* hypocrisy. I'm unimpressed with the amount of haste Bliz puts on gear for plate wearers, to me as a death knight haste is almost a bad stat and it seems that way for pallies and warriors too. Am I missing something or is haste as useless as I think it is? I bet it is bigger on that gnome then it is on my female blood elf paladin. Yes, it is great weapon. But when I see so much haster and for SoC paladin relatively fast (3.40) I think, what about Seal of Blood? Is this better with SoC or SoB? This seriously looks like Cloud's sword. DUCKTAAAAAAAPE! @ Fazy: Seal of Blood / Martyr will always be your standard Seal for PvE, and in some cases PvP aswell. So depending on the situation that this drops in PvE, I'd say Blood / Martyr, Seal of Command for PvP. How is it possible to dual wield this sword? Isn't it 2H? Im wondering if this is a way better upgrade from inevitable defeat for a blood death knight. the stats are good, but is it worth it? Let me straighten this all out in layman's terms, so we don't all write books about this confusion. DPS is "damage per second", so "DPS per second" would be "damage per second per second". "something per second" refers to the rate at which the quantity of our "something" changes, every second. therefore, if our "something" were the "something per second" ITSELF, it would be " 'something per second', per second". that would indicate that our 'something per second' is changing by a certain amount, every second! Therefore, our damage per second is changing every second, and if this were a positive value, it would be getting bigger and bigger every second. if this were a negative value, our damage per second would be getting smaller and smaller every second. A: "Man... that Biology exam was like, totally hard... I like, totally bombed it... my boyfriend said it was like, totally hard too. I totally didn't study for finals"
B: "Yeah, like, I know, right?" A: "Yeah like, but at least the Calc final was like, totally easy... I didn't even study for it!" B: "Oh my god, really? I like, totally didn't study for it either!" A: "Yeah... like, how does Mr. Smith like, expect us to memorize all of that Biology stuff? We'd like, totally have to study for 8 hours to know all of that!" B: "Omigod, you're like, soooooo totally right... at least in Calculus, you just have to understand the concepts and sort of get a feel for them, and be able to solve pretty much anything, like, right?" A: "Totally. Like, whatever. So... you going to the game later? My boyfriend like, TOTALLY just got on varsity!" Equipping this item will cause you to fall into the ground due to the severe weight of Iron and Duct Tape! Pretty nice sword for raids. But, you'd better replace it with Betrayer of Humanity coz it's still better. Nice design by the way. All in favor, say "I"
All the little children that will eventally downrate this, say "Nay"
For any Berserk Fans, wielding this sword is a must on your character. Guts would be proud. It's really just notation for representing really, really, tiny itty bitty slices of time, because the rate at which something happens (in our case, damage) over a certain interval can change at each instant. remember in 7th grade or so, during algebra I class, they taught you how to find the slope of a line connecting between two points? well, "delta" just means "a difference in". So if you're a rich bugger that started life off with 1,000,000 dollars, and you die with 1,000,005 dollars left, what would your "delta $" be? 5 dollars (difference of 5 bucks). On the other hand, imagine you started life off with just 15 bucks, and you died with 20 bucks in your bank. What's "delta $" in this case? same thing, 5 bucks. it's just showing differences. Granted, these comparisons are over very, very long periods of time. Maybe in the first case, you earned 10000 dollars every day, but spent the same amount over the course of the day. That's why the concept of INSTANTANEOUS rates become important in analyzing systems, because stuff doesn't just follow the same constant speed or rate (imagine a car accelerating... its speed changes at every instant... one moment it may read 50 mph on the speedometer, but the next moment it'll read 60 mph... what's "delta speed" here? 10 mph difference. Over how much time? "delta time" would be the difference in time when you read the 50 MPH and the 60 MPH. In CALCULUS, though, we go one step further and chop that difference into LOTS and LOTS of tiny differences... these differences are just so small that you can't imagine how small they are. the difference between "delta" and "d" in front of something is basically a matter of the scale we're talking about, to put it simply. If you just want an "average" rate, you use "delta" to show differences. If you want the rate at the EXACT INSTANT that you are talking about, you use "d" to notate the difference in time (the difference is actually infinitely small). Can a DK tank roll on this? I mean, cant it be a nice tank sword? Please? A bit? PS: If not, I ll reroll a belf pala. This is my long pointy sword. Terrifying, petrifying and OMFGPLEASEDONTHURTME would also suffice. This is the coolest sword i have seen in the game thus far. As a Fury Warrior, it is my dream to be able to duel weild this beautiful sword. For such a big weapon it sure does have a fast attack speed. It also wields you everywhere else. I keep mine in a Penny Pouch. Armageddon wields you even if you aren't in Soviet Russia. This is my favorite two handed sword in the game. its design is original and it freaking huge. I wouldnt mind replacig mine soon but im happy with this. "Where did you get that sword?" are you still in high school...? lucky you (i really mean this :P). i wish i had attended school in the US. everything i wrote up there was based on what i've seen on tv programs and stereotypes, to be honest ;P. i live in a pretty regimented society where judo, soccer, and baseball is srs business, and american football is teh sux0r. This sword is bigger, and more awesome than your average sword or blade. Also, I'm disappointed to see a "Disenchants into.." tab. That's just wrong. who would be so stupit to disenchant this? 1. the place where the final battle will be fought between the forces of good and evil (probably so called in reference to the battlefield of Megiddo. Rev. 16:16). 2. the last and completely destructive battle: The arms race can lead to Armageddon. 3. any great and crucial conflict. If I'm correct this is the same sword the Black Knight has. If you are reading this, look closely on screenie nr 20. those pics are what makes wowhead what it is. This is a FREAKIN awesome and it joins the list of WotLK weapons that look like they've broken and been made again (Poorly). Hey look i saved you the trouble. Aren't I nice. Is this weapon good for a dps dk? This one-time awesome 25 man raid weapon now takes a back seat to both 2h weapons that drop from the new Fall of the Lich King 5 man dungeons, on NORMAL. Farewell Armageddon, you have been completely outdone in the same expansion. .....But it still looks much cooler. This seems to be the longest weapon in WoW, propably will even be the longest weapon ever seen (and is the longest weapon released in Wrath of the Lich King -expansion). lol imagine a gnome DWing these! How hard is it to gain this weapon? and is it worth it for tanks to have or should i go with a different wep? According to some premillennial Christian interpretations, the Messiah, the "Lamb", Jesus Christ, will return to earth and defeat the Antichrist (the "beast") in the battle of Armageddon. Then Satan will be put into the bottomless pit or abyss for 1,000 years, known as the Millennial age. After being released from the abyss, Satan will gather Gog and Magog from the four corners of the earth. They will encamp surrounding the holy ones and the "beloved city". Fire will come down from God, out of heaven and devour Gog and Magog after the Millenium, and the Devil who deceived them is thrown into Gehenna (the lake of fire and brimstone) where the Beast and the False Prophet have been since just before the 1,000 years. Other Christian scholars interpret Armageddon as being an idealized location, or a reference to Mount Sinai. The word Armageddon appears only once in the Greek New Testament. The word comes from Hebrew har məgiddô (הר מגידו), meaning "Mountain of Megiddo or "place surrounded by hills". Megiddo was the location of many decisive battles in ancient times (including one in the 15th century BC and one in 609 BC). The town Megiddo is approximately 25 miles (40 km) west of the southern tip of the Sea of Galilee (or Lake Tiberias to the Romans) in the Kishon River area. In modern usage, especially in literature, films and music, the term has become synonymous with any cataclysmic event. Variants have been coined such as "Snowmageddon" to describe a serious snow storm; U.S. President Barack Obama used this term for the blizzard that hit the U.S. capital in February 2010. Which is why it is all broken and fixed up and crap on the look. screenshot 19 - is that a human ? Jesus called. He wants his Armageddon back. 1 Sockets(if you use the bold scarlet ruby than you gain+20 strength(match bonus)). So i think this sword especially is not the best but it's still epic. Isn't this the sword that the Black Knight uses in the fight in ToC? Oh well, Duct Tape can fix anything! A fury gnome with Titan's Grip using two of the swords is way scarier than an arms/prot warrior using one. Dwarf anyone? You should see how this Tauren wields these. All I can think about when I see this weapon is Cloud Strife. Wouldn't Jesus be the tank, sacrificing his own HP for the rest of the party/raid, so they wouldn't have to? But why they wasted such a goood name on such a rubbish sword for the future paches? I totally love this weapon, it's basically wielding YOU. When the looting chest appear's and it's a bigger box than your average chest from the 4-Hman. At that point, you know this is gona drop. No way it can be kept in any other looting box..
Wow... someone was really busy duckt taping this. Yes, the item does look out of place. It was originally planned to drop from the Utgarde Pinnacle Tier 7 raid, which was then cancelled. Anything already designed, like Armageddon, was moved to the recycled Naxxramas raid. Using this on my DK when transmorg thingy comes out in 4.3. Also going to farm it on my warrior so he can DW them! Hell yea. I finally found the bumper to match my car door. It's a pretty big sword, but on a female human it's massive. On female humans the weapons scale is increased by like 200%, so this sword is about the length of 3 humans lying back to back. Great two hand swod for transmogrifier on patch 4.3.0! This sword looks a lot like the sword Cloud Strife carries in the Final Fantasy VII series. Best 2h sword for moggin' or is it just me? Great sword and the enchant is vividly visable. 3 weeks and no drop.. im so unlucky. View this in model viewer, human female, deathstrike. You don't want to be standing in that. Dudes, dudes, you've got it all wrong. That's not duct-tape, that's HOCKEY TAPE. Stupidness aside--I do want this for Transmog. Looks bloody fabulous with the DK starter blues. i got one from the 4 horsemans chest in naxx 25... why theres only gluth in the dropped by ? This sword is just huge, my opinion is that it´s also ugly saying this as fanatic mogger. Feel free to vote this down. 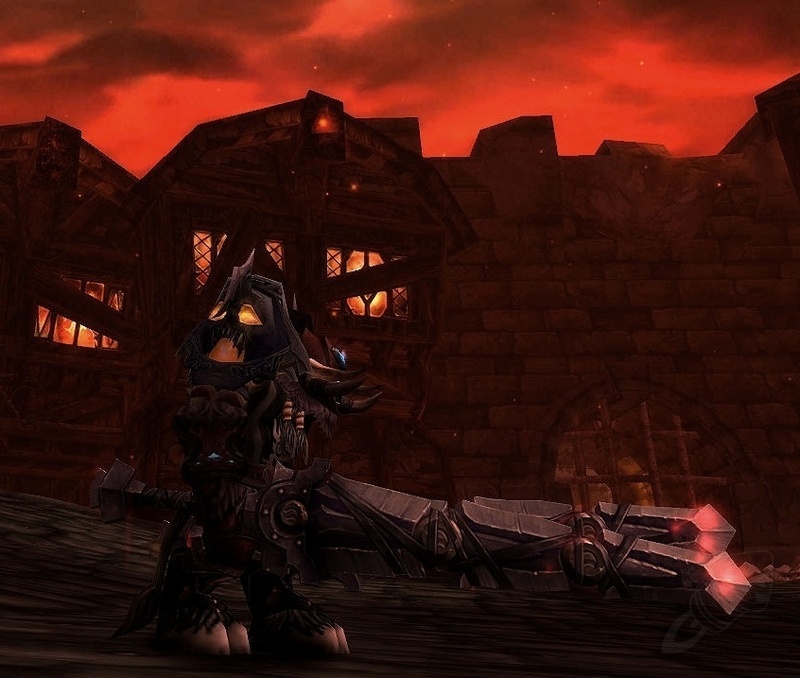 Are you a Death Knight seeking this sword for transmog? Never fear, you can now forgo the annoyance of having to form a pickup group to do Naxx 25 for this, as 25-man Military Quarter is now fully soloable thanks to Charred Glyph. Start Military quarter. Pull trash as you see fit. If you are specced Roiling Blood as you should be for this content, just outbreak and spam blood boil to faceroll down all the trash packs until you get to the bottom of the stairs. Death Knight Cavalier used to make 25-man Military Quarter impossible to solo, as Bone Armor absorbed 1.2M damage and could not be broken unless you wanted to spend six hours slowly whittling down these trash packs. With the glyph, just Icy Touch the bone armor buff off and focus them down. Skip Instructor Razuvious with a Lesser Invisibility Potion. He is killable, but you need somewhat decent gear to do so. AOE down the weapon trash and DK trash in the next room and hallway. For Gothik, just AOE down the adds on live side then continue to AOE adds down when the gate opens until everything is dead, then hit him until he dies, nothing he or his adds do is remotely capable of killing you. AOE down the series of trash packs between Gothik and Horsemen, continuing to purge bone armor off the riders as they come. For Horsemen, pull. Drag Kor'thazz over to Rivendare, then drag them both to Zeliek and proceed to spam AOE, focusing Kor'thazz down first. When the Blameaux debuff reaches about 6 stacks, run over to her until it falls off, when Zeliek's reaches 6 stacks run back to him. Just spam AOE and use stronger defensive cooldowns when Kor'thazz and Rivendare are still up once their debuff stacks on you reach about 10. Once they are dead the fight is over. Enjoy your sword. Life and Death and Broken Promise are also obtained during this run (from Gothik and the 4H chest respectively) and are also interesting transmog options. Looks a bit like Cloud's sword. Held by duck tape or not, this blade looks legendary! In Soviet Russia, sword wield YOU! Killed the boss for this wep around 25 times and never ever seen it drop :D Oh well maybe next reset! I wield this sword in honor of Guts from Berserk. For any goblin DK/warrior looking for this sword to transmog - it just looks ugly on them. Nearly 1/4 of weapon is sticking in the ground when it's on your back. View in 3D with gnomes.. Press dance and it looks like they're shredding themselves. This item was used for replacing Corrupted Ashbringer. This sword is the same sword that The Black Knight uses. So I checked the drop rate on this thing. I guess in Pandaria it's way more. I think it dropped me twice in about 6 clears. And my friend got one on his second clear. Still cool Duct Taped sword I guess. I think my grandfather would've done it with yellow tape tho. No matter what race you are. It will look like it's dragging on the ground when you run. 3D view it on male tauren and put "Torpedo" as animation. Face Pose on the Gnome 3D model is the best thing I've ever seen on WoWhead's 3D models. See, cuz right now this is the part in any RPG ever where you have to kill God. It's pretty rad. I love killing God, I do it every day. You know, some people have breakfast, I kill God, with my super-giant house-sized sword, you know, it has 3 mortages in it, 2 families can live in it, but instead I use it as a weapon; it's pretty rad. Gluth dropped it today,and looked at the droprate. I was told that Gluth doesn't drop the Armaggedon.. Also, I have addon called "Mogit" that tells me a boss called "Sir Zeliek" from Naxxramas drops the Armaggedon. .... Is there any truth to this claim? FOR THE LIGHT! THE LIGHT CAN PENETRATE ANY DARKNESS! Dropped from the four horsemen today. I got this on the first try when I went to solo Naxxramas out of boredom. I didn't even know it existed; I'm so glad I went. Also drops off the Four Horseman in Naxx on 25 Man only. This dropped for me just seconds ago from the Four Horsemen on Normal 25. The loot table doesn't reflect this, but that's where it seems to drop. It took me between 10-15 attempts. This just dropped for me in Heroic 25 man mode from the four horsemen. Got it during my first and only run of Nax. Didn't even realise it was rare until I checked it out here. Had it sitting in void storage for over 2 years and only noticed it due to the new appearances feature. Feel bad for people who farm this and I didn't even realise I had it. Might use it for transmog but the artifact weapons are pretty sweet looking so we'll see. I have been farming for this weapon a total of 3 runs before it finally dropped and It did not drop from Gluth. I defeated the 4 horseman in the Military Quarter, and opened up the chest which contained the weapon Armageddon, Damnation, Breastplate of the Lost Conqueror and Breastplate of the Lost Vanquisher. I am completely surprised and am glad that i decided to do the whole Raid instead of just the Gluth part and thought this might be really important information for others who might lose the opportunity to have the same happen to them. Just looted this today off The Four Horseman 25-man Normal difficulty in 8.1.